At the dawn of the Trump era, Labor is a sleeping giant with the ability to unite diverse swaths of American society and ultimately transform it. For many years now, a widespread cry has been raised of the imminent death of American Labor; of the end of working people as a living force in the life of the United States. We hear that the workers’ movement is currently is in its last painful death throes – irrelevant, dying, lonely and forgotten by a technologically rapacious consumerist society that has moved past Labor as a social force and relegated it to a long forgotten past. This cry has come from many different quarters1, including from parts of the labor movement itself, where there still lingers a strange nostalgia for a time of now- mythologized struggles. It also comes from many activist circles, who for many reasons, have fractionalized into specific issues and have removed themselves from the day-to-day concerns of regular working people, of what motivates people in our society. In adopting vanguardist positions, many have left the mass of people behind, looking at the plight of the oppressed and the real desires of working people with a sneer – as a means to an end – in a similar vein to Evangelical Christians who embrace Jewish culture, not as worthy in itself, but as a means to initiating the “End of Days”. And it comes from within many unions themselves, where anti-democratic tendencies have taken root on one hand, and where members do not actively engage and work to solve problems on the other. Most pervasively of all, this death cry comes from our so-called mainstream media, where working people are constantly bombarded with messages of the futility of any sort of identity or action that is not tied to their role as active consumers in a capitalist order. Working people are not encouraged to see the basic unity of their circumstances – whether they be in the workplace, unemployed, or even retired – and instead are drawn into any number of subcultures which ultimately drain energy and purpose, and which mask the nature of our social relationship. Donald Trump – the cry continues today – is the death knell for unions and the rights of working people. Unions are dead, they say; the American Labor Movement is dead. And despite this now widespread sentiment, there ironically has never been a time that unions were more needed. And not just as some calculated method to keep the “Middle Class” afloat, as some Democrats tout it – but because of the intrinsic social and economic bonds and unity of purpose that unions contain and which transform not just labor relations, but our society a whole. That American Labor – and the Labor Movement in the United States – has in various ways been lulled into an extended torpor of complacency and division is not in doubt. But as a force, it has never really ceased to exist; it can never really cease to exist as long as we live on the planet. In fact, it isn’t terminally ill so much as dormant – asleep to its own strength as well as to its own necessity. Of the need for people to produce, create, develop, and evolve through endeavor; as contrasted with mindlessly buying, consuming, ingesting, throwing away and buying some more that characterizes where we currently are. Across our land, most people work; they have jobs and are meaningfully employed – and more importantly needjobs to earn a living and to survive. Working people – those that rely on an exchange of labor – that is, the vast majority of people in this country, need a way to have their real needs addressed and not be bullied, cajoled and threatened into unfair situations that hierarchical relationships engender. The very context that unions of workers provide – and will always provide. Nevertheless, our unions have entered a deep sleep. To label this sleep a result of pure apathy on the part of working people is too simplistic and gives the lie to the people who would destroy unions and who benefit from that destruction. Many factors have led Labor to this crossroads, and it is not all rooted in the past, but in the very way unions are understood. One factor is the pernicious illusion among people in a workplace that a union is somehow “The Union” – namely, that it is an organization outside of each member, an institution where people turn their troubles over to someone else and where they are solved. An external workplace office that deals with services and disputes in a workplace. In many places, this is self-fulfilling consciousness. In reality, unions are a direct expression of the concerns of the workforce because they are the workforce itself. The union is the collective voice of the workforce, which gains its strength through that combination. Whether it be health and safety concerns, grievances, creating a real communication among members, unions gain their power by the fact that people band together – that individuals unite – work together to find solutions and have a voice and a strength through participation. The most successful unions are those where each member understands and exercises their autonomous power, instead of a place where people “turn their problems over to Jesus.” Salvation comes from each, not from on high. A second factor which evolves from the first – and one which gets constant play from anti-union activists – is the petrification of many union structures. With less active participation in the union, there arises slowed responses to management threats and a lack of democratic and transparent processes by union leaders. With their own hierarchies, self-censorship takes hold, and the workers in an organization begin to the mirror the very approaches of management, which only builds distrust among the rank-and-file. People in many workplaces notice and complain about these two facets of the union challenge; conspicuously, though, they do not get involved. Members and non-members alike complain, and very few actually, actively get involved to further the conversation in each workplace around the country. The work of the union is perceived as something other than the work of the members and of the organizations in which they exist, and few are willing to engage in what becomes thankless work. With the lack of participation and through petrification, the union conversation in America quickly turns into one of abstractions and platitudes, instead of specific work contexts. In this crisis of engagement and action for organized unions, people – especially in the labor activist circles – talk of harnessing radical ideas and methods of Labor’s past, of infusing new blood. But, in effect, this infusion doesn’t end the torpor and raise the sleeping giant. It comes across as hollow and insincere. Like that of the Republicans in the United States, who starting, in 2008, who talked about reaching out to people of color, Gay and Lesbians, and Hispanic immigrants and who want to develop a strategy to make black people feel more comfortable in their political party5; but nowhere did they actually support policies or initiatives that people of color actually care about or believe in. Ideas are living actions, not medicines to be administered. In fact, the very principles that American Labor needs right now – of federalism, of decentralization, of autogestion – that singularly beautiful Spanish word for workers’ self-management – of truly horizontal communication and decision making, these are living ideas that matter in the workplace and in our society and whose time has come, ironically enough, when pundits are calling for the end of organized labor. They are also ideas born in our collective history of American Labor and international Labor struggles and are not new – but they were ideas that we once so futuristic that people died so that those in positions of authority could ensure that they never lost their positions of privilege and power. In the past, labor unions and federations once imported and exported ideas, the way we now export movies, computer software and soda and imports cheap manufactured goods created by exploited labor in China6. This is one thing that many disillusioned activists are right about: America used to export powerful ideals and examples of labor advocacy; now it’s pop music, militarism, fast food, and soda. Anyone who seriously considers workplaces in our country can see that American Labor is quite alive – breathing, heart pumping, feeling – but in its deep sleep, a world of dreams and fantasies, from which it needs to emerge for the good not just of American society, but of the world. In order to rouse itself – to rouse those parts of ourselves, that have been so long asleep all we need is engagement. If each person in every workplace reached out to their peers and communicated about work, this would change. From the most micro level, a social consciousness needs to return; a consciousness of union in its broadest sense. The relegation of work to something superficial or painful (“it’s just a job”) ignores how much of our life-breath is expended in day-to-day work and hides the relations that make work necessary in the first place. The accompanying silence about work – and the vast dearth of local work histories – helps fuel the ignorance and apathy across America. But this isn’t limited to a workplace context alone. Many of the critical societal issues that we are facing – inequality, racism, violence, hatred – have been somehow, somewhere carefully removed from the larger contexts where to comprehensively address them and resolve them. It’s not to say that this understanding is not recognized, simply that it does not exist in as many places as it should, becoming a source of division and weakness. The unity of purpose among working people, the union context as properly realized, is the one area that unites broad swaths of our American Society. Despite the oft-cited divisions that this past election laid bare for many, the one factor that can bring people together is work. Not “the work of” but simply, work. In many ways, the context which is pro-immigrant, pro-LGBTQ rights, pro-inclusivity, and at the same time anti-racist, anti-bigotry – already exists, lying dormant because the so many ignore the organic linkages that Labor provides. All one needs to do is look around, and the links to groups and camaraderie and solidarity are there, already in existence. But the consciousness of American Labor it has been lulled into a dangerous complacency that ultimately facilitates statism, authoritarianism, and despotism which has now given rise to a celebrity “culture” and a “Make America Great Again” fascism. People who work, within various trades and as a mass of people that share a basic circumstance – of having to earn a living and be meaningfully employed or even be engaged with the economic world in retirement – and that is a facet that helps the process of rousing the sleeping giant. Not to be awakened to be used to some political end by desperate politicians or manipulated into some American Ponzi scheme – but to shake off the sleep, cast aside the lethargy and the bad dreams, and to begin to construct again, to build again, and to take pride in action. And, yes, there is also that exceedingly rich legacy of the past, of hard-won battles which is lost to the mass of people; where people banded together in solidarity as sisters and brothers. CNN, Fox News, MSNBC would have us believe that the distant past is the Civil Rights Movement or the “Greatest Generation” of World War II – the last times of unity that mattered. When the reality is, the American Labor journey goes back a lot longer than those and continues to this day. Besides engagement at the local level – at the workplace level, another piece that is needed is an ongoing reporting of events around the working world – including in the U.S. – to help create an awareness among working people – something which exists, but in precious few outlets.7 This helps working people build a consciousness of their own strength, across artificial national and ethnic boundaries. Branching out from local workplaces, broad-based labor coalitions and federations of worker assemblies of all orientations need to come together that put aside organizational differences, so that ideas can again be the common currency. Whether based around specific issues before us in the Trump era – protection of immigrant communities, respect for different belief – local unions and their members need to reach out to sisters and brothers in their communities, in other unions, too. This is not to put aside all historical and ideological concerns – merely to invest energy in the structures that work: horizontal, non-hierarchial, truly democratic structures and relationships. To set aside all exclusory models, and to return to creating alliances to achieve a popular mass movement to defeat the Trump agenda – or whatever form the immediate and systematic attacks against self-determination and autonomy assume. Despite the superficial differences and varieties of responses – that is, apart from those that are not authoritarian, statist, or oppressive – there is room for conversations, dialogue, and joint actions. 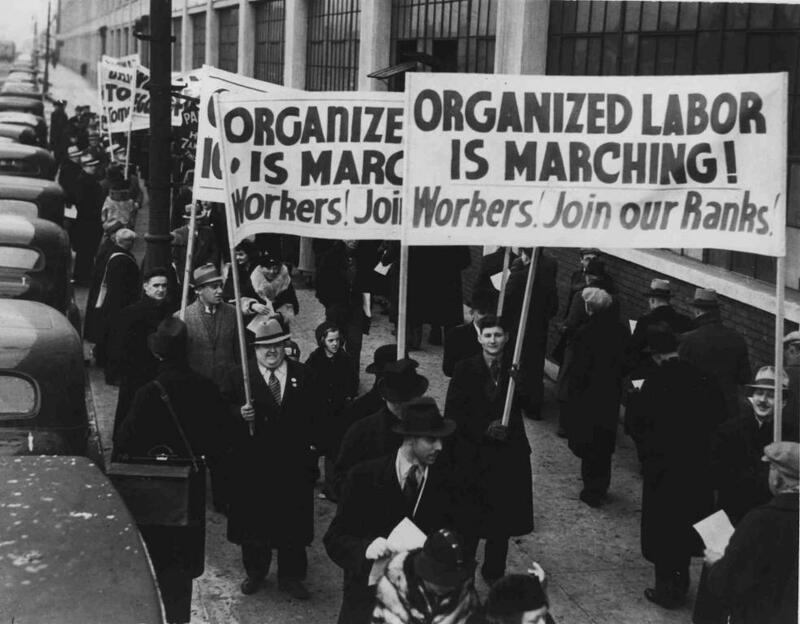 At crucial moments, the American Labor movement of our distant past was a popular mass movement, where a huge variety of labor unions with logical affinities banded together under common banners8. Those varied voices of the past still call out, trying to drown out the siren call that would lead working people to setbacks and disasters by not reaching out to each other. David Fernández-Barrial is a federal librarian and union steward. 5. Ultimately, it has been interesting to watch the Republican party in the U.S. recently shed this inclusive approach, and unite behind a candidate who used the opposite tack. Through divisiveness ironically took the prize they wanted. 6. One almost constant feature of authoritarian Socialist regimes across the globe is the noticeable absence of free trade unions. 7. One thing that our publication – Ideas and Action (http://ideasandaction.info/ ) – has done in the past, and will be focusing on in forthcoming issues – will be just that. To provide coverage on ongoing worker challenges that are being faced in the United States, as well as abroad, to show that links that already exist and which must be strengthened. A broad-based consciousness of unions and of the role of working people is necessary and ultimately results in the ripening of ideas into transformative action. 8. The demand for Eight-Hour Day and for the end of child labor are notable examples.